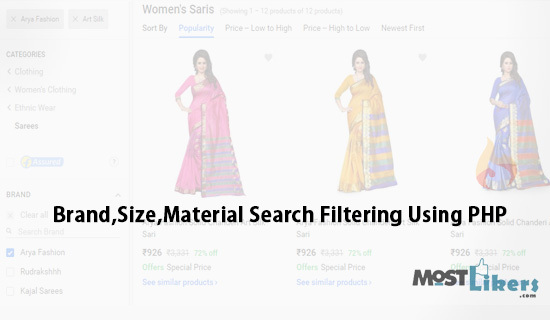 Recently I have posted Product Brand, Size, Material Checkbox Search Filtering Using PHP And Jquery. This search filter script doesn't have pagination.later I get request message about pagination. In this tutorial, we will discuss Product Ajax Search Filter with Infinite Scroll more Using PHP and MySQLi. Load more it's very easy user-friendly without refresh the page user can get the product like the data. Generally, we added this tutorial related to building an E-commerce website. For more learn about basic of knowledge about ajax checkbox search filter and infinite scroll more learn this tutorial. For a quick learn and script implementation has a look at the live demo, Youtube video tutorial. To get product information a table need to be created in the database. The following SQL code creates a product with some required fields. insert some product information for checking the script. Create a new file config.php load the database connection code. The following codes contain the index.php file. For an UI implementation, we have used a bootstrap template. For a left sidebar filter data display on the checkbox. Fetch all the brand, material type, size data without duplicate and repeated data. So, I would suggest use Group_by() it will combine based on the brand name, size. This script loads the data based on the scroll more data it will send ajax request to the autoload.php file. $(document).height() - Find the page height when page scroll. This following code contains autoload.php. On the scroll, the data it will post through ajax, based on search request array data will filter the SQL query. url_clean() - It will clean the URL special character code. We hope this tutorial helpful for you. We request to Share your feedback or Suggestion to improve our coding standard. Thank you have a nice day. Page is reloading. Please help me..
Hello, Is there a version with pagination?